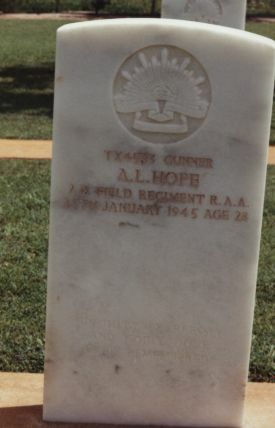 The headstone of Arthur Laurence Hope TX4533 at Atherton War Cemetery, Queensland. Gunner Arthur Hope Died on Active Service on 25.01.1945. Born at West Kentish on 17.07.1916, he enlisted at Hobart on 27.03.1941.